On Kallada G4, after 4 years! 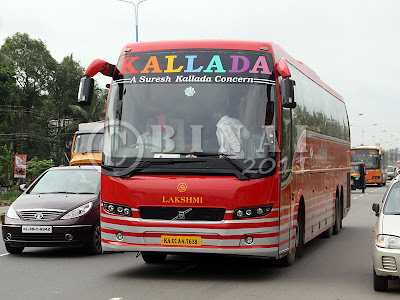 Kallada G4 - a smaller company, part of Kallada Group run by four brothers - recently introduced a new Volvo B9R service between Bangalore and Changanassery via Ernakulam and Alappuzha. Kallada G4 is a smaller operator compared to the brother concern Suresh Kallada. G4 operates all of 3 services - one each to Changanassery (B9R), Guruvayur (Semi-Sleeper Non-AC) and Kottayam (Sleeper Non-AC). Since the bus was new, booking on this service was a no-brainer - they did not have online reservation at that time, and I had to make a visit to their agent - Friends Travels at Madivala for the booking. The booking process was quick. The fare was Rs. 900 (compared to Rs. 950 on Suresh Kallada). The bus was almost empty at the time of booking. Interestingly, the bus that would carry me back was parked right outside the office at that time - had a quick look at the bus. Warning: Very long post. Might not be suitable for the general audience. It was chilling cold – sending shivers through my spine – I get off the train. Armed with a flashlight, I find my way to level ground. 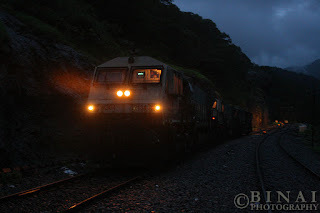 In the mean time, the locos let off a long horn, and starts off with a jerk. Jayasankar and me walk on to the other line to let the train clear off. Behind is the station building, which was well lit at that hour. The clears off, and we walk towards our shelter for the next two hours. It is a small chapel – with a couple of low height walls which serve as a bench. We settle down on one of them, rest our bags, and try to catch a few winks. On the day-night multi to Bengaluru..
For long, I've always been wondering why there aren't any day time bus services from Southern Kerala to Bangalore. Day buses always ran from Coimbatore, Madurai, etc to Bangalore. 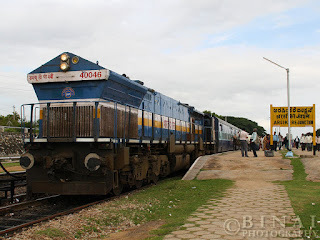 There is a day time train from Bangalore to Ernakulam. 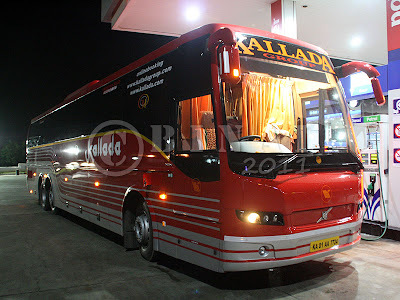 About a month back, a friend called me and said, Kallada was running a "day time special B9R" to Kerala. I was left awestruck - a quick glance at the Kallada website clarified that it was NOT a special, but a regular service! Wow! That was a long time dream come true for me! I love traveling over the day, and this was the perfect service for me. There comes a trip to Bangalore - like a god sent gift! For the first time, I'd also be traveling without luggage! I mulled by long term desire to travel bus-hopping, but somehow, I wasn't very ready to do it this time. Booking on the Day Volvo came as a no-brainer to me! The ticket was booked online, seat on the first row. The bus was absolutely empty when I made the reservation.